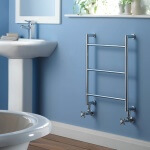 It really isn’t all that long ago that the only place you would have found bath towel warmers would have been in luxurious top-tier hotels and some of the world’s most expensive spas. Today, however, nothing could be further from the truth. You too can have the best bath towel warmers in your home if that’s something that you’re interested in. All without having to worry about breaking your budget in the process. But the question is, what exactly should you look for in order to bring home the real deal? That’s what we have today in this handy buying guide of mine. This first one is a good candidate. Brookstone has definitely been responsible for selling more gizmos and gadgets than probably anyone else. But that doesn’t mean that they don’t introduce some pretty good solutions all the time as well. And that’s exactly the case with this Brookstone towel warming device. Simple, straightforward, and very compact. This extra-large capacity warmer isn’t going to eat up very much space in your bathroom at all. In fact, you’re going to be able to effortlessly tuck it into a corner of your bathroom without any trouble. It only takes up about as much space as a traditional bathroom waste bin might. But don’t be fooled by its small exterior. 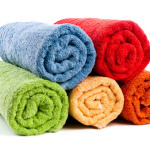 Its extra-large capacity allows you to easily accommodate up to four extra-large and very fluffy towels (or eight “traditionally” sized towels). Then heat them up to 120°F inside of just 10 minutes. That makes this product one of the best performing options on the market right now. A little bit Plain Jane in the aesthetics department. The good news is this device isn’t going to look out of place regardless of your overall bathroom design motif. It’s going to fit right in and feel at home the moment that you plug it into the wall. The Amba RWH-CB is exactly what you would expect from a top-of-the-line and truly luxurious addition to your bathroom. The exact same kind of product that you would find in any high-end hotel or resort. This hardwired option is going to require you to contact an electrician to set it up. But it’s going to provide you with much more consistent and reliable results across the board. Thanks to the radiant heat solution that it provides throughout all crossbars and both vertical supports, you’re going to be able to heat up towels, bathrobes, and even bedding just by hanging it from this rack. Beautifully designed especially for those that want to add a hardwired unit to a modern bathroom. It doesn’t get any cleaner in the aesthetics department than this. The odds are pretty good that you’re going to fall in love with everything that this model brings to the table. At around a few hundreds, it isn’t the least expensive option that you could decide to move forward with (especially since that won’t include installation fees if you have to hire an electrician). But it is worth every penny! One of the most compact (but incredibly effective and efficient) options your money can buy today. This WarmRails RTS 34 is going to give you the most bang for your buck hands down. You might notice that it’s significantly smaller than most of the other options on the market right now. But the intelligent design of this towel rack allows it to accommodate up to 10 towels, 20 wash cloths, or a variety of different clothing and bedding options. All of this is possible without sacrificing heating performance whatsoever. The entire unit can reach and then maintain its maximum temperature of 120°F without any extra effort to speak of. It’s possible to mount this device directly to a wall. But you’ll also have the chance to use it as a freestanding option as well. This makes it significantly more portable than most other competing products on the market. And it gives you the opportunity to use it in your bathroom, out by the pool, or even in your bedroom/dressing room! This one is not exactly the cheapest available. But it never claimed to be, either. This is a quality solution across the board, and one you would be happy to have in your home. Want something budget and energy friendly? Of all the options out there, you’d be very hard-pressed to find anything more energy efficient than this WarmRails HCC. Easily keeping all of your towels dry, toasty, and perfectly warm without any difficulty, this entire unit is powered by just 75 W.
And it can be plugged directly into any traditional wall outlet without having to be hardwired. The unique radiant heat system built right into this portable/wall-mounted unit make sure that the energy is distributed evenly. While at the same time allowing this model to come up to temperature (just south of 120°F maximum) in 10 or 15 minutes – no more! It might be a little bit on the smaller side of the fence (after all, it is a compact/midsize product). But it’s able to accommodate multiple blankets and bedding, delicates, washcloths, swimsuits, and almost as many towels and washcloths as you could reasonably need after a bath or shower! Best of all, you’re going to be fully protected by a one-year limited warranty so that you don’t have to worry about anything going wrong after you invest in this device. Simple, straightforward, and intelligently designed. 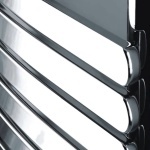 The HomeLeader TW-05W is as versatile a towel warmer as you are going to find anywhere today. This single piece unit is going to be able to effortlessly keep up to its maximum temperature (just under 120°F) in 15 minutes or less. And will then be able to maintain that temperature for upwards of 30 minutes. Sometimes even more without blowing up your monthly energy bill. This is all thanks to the unique towel radiator heat system built right in. And of course, the intelligently designed module that takes advantage of the overall structure to provide consistent and efficient heat across the board. You’ll be happy to know that all of the towels, wash clothes, bathrobes, clothing, or bedding that you place upon this rack when it is on will quickly come up to temperature. And be ready to go the second that you step out of the shower! It might not be exactly as attractively designed (aesthetically, anyways) as some of the other options. But you aren’t going to be able to find this kind of consistent power and performance at such a low price tag anywhere else. 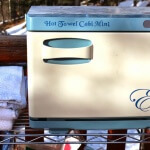 If you want to add a new towel warming unit to your bathroom without blowing up your budget, this is the one. What exactly is a towel warmer for bathroom? For starters, bath towel warmers are exactly what they sound like. 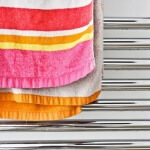 A towel rack that uses radiant heating to warm your towels while you’re in the shower. However, some of the best products out there are able to do so much more than that. They are also able to dry your towels (helping you avoid doing extra laundry), are able to help you warm your blankets or your sheets. They can even help you warm your bathroom so that you don’t step out onto cold tile all the time. To begin with, this kind of home appliance is going to give you the kind of high-end luxury you would expect at the best hotels and resorts around the world. There’s nothing really like stepping out of a nice warm shower into a bath towel that has been toasted appropriately. 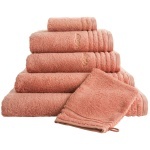 You can say goodbye forever to moist, cold, damp towels once and for all. 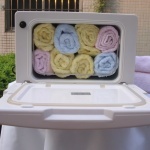 Your new warmer is going to give you nice and toasty towels also no matter what the temperature is, and is especially beneficial in those freezing cold winter months. Secondly, a high-end product is going to make sure that you don’t have to do nearly as much laundry as you used to have to do in the past. 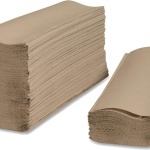 Everyone knows that bath towels – especially when they are run through the washing machine – are going to soak up a tremendous amount of water, and are going to require a lot of time and a lot of energy to dry completely. On top of that, if you use a new bath towel every single day, you’re going to be doing a lot of laundry every week – and run the risk of running out of towels unless you stay on top of things. Thankfully, with a high-end bathroom towel heater come all of that goes right out the window. You’re going to be able to throw your used towels right on top of your heater and let them do all of the heavy lifting for you when it comes to trying them out. Finally, you’re going to be able to use some of the better options out there to warm a lot more than the towel that you use when you bathe. Most of these options allow you to throw comforters, quilts, winter jackets, and pretty much anything else you can think of on top of them, toasting them up so that you stay nice and warm when it’s cold or damp outside. To find the best ones, there are a few things that you’ll want to keep in mind. For starters, think about the kind of budget that you’re going to be using when you hunt for a new warmer for each of your bathroom. 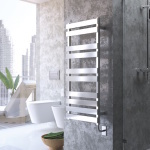 You should expect to spend at least a few hundreds on budget friendly towel warmers, and can expect to spend anywhere upwards of $4000 or more if you’re looking for something a bit more involved come a bit more luxurious, and a bit more “built-in”. Next, you’re going to want to think about choosing between electric or hydronic models. Electric warmers are generally the most energy-efficient of the bunch, and use a dry heating element and direct heat to get the job done. 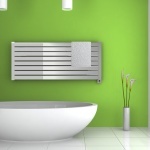 Hydronic warmers, on the other hand, are essentially oversized and stylized radiators, using hot water to radiantly heat your towels up to temperature in a fraction of the time that electric towel warmers take. Electric models are considerably less expensive than hydronic ones for the most case. And they also give you the option to run as a standalone system that plugs directly into the wall. Most hydronic units are going to be wall mounted and require that you call in the plumbers for help. Should you go with the convenience of an electronic model or the reliability of a hydronic one? Do you want your new device to be mounted directly to the wall or as freestanding models? There are, of course, more to think about. But the above information will definitely help you stay on the right path. I hope my buying guide above is informative enough for you to pick up a great product for you and your family. As always, if you need any assistance, feel free to contact me.